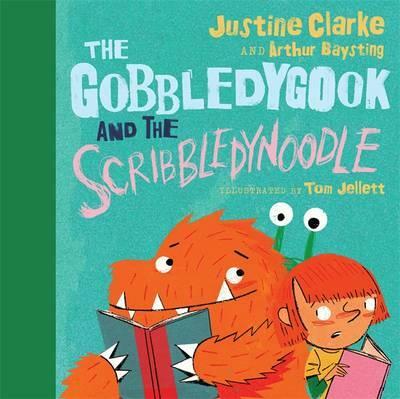 The Gobbledygook is back in this rhyming romp for little ones. Gobbledygook is in his favourite place--the library. He's reading his favourite 'mon-story' book, gobbling up the storyline. He mixes up the words, whispers and shouts--that's why he's called the Gobbledygook! But goodness me--what's this? His favourite book has come alive! Out jumps a monster, right off the page! This scribbly creature is called the Scribbledynoodle and he quickly sets to work scribble-scrawling hither and thither, all over the books. Gobbledygook and friend is appalled at the scribbling-in-library-books thing. And they tell Scribbledynoodle just that. So what does he do? He sets about drawing all over the library walls and shelves, and even the librarian herself! To stop the Scribbledynoodle in its tracks, they take it outside and instead find the scribbles and drawings in nature--in the clouds, in the shiny trail of a snail, in grassy shadows and sprinkler-drenched rainbows. Not only is this a clever book in regards to concept, it takes a very difficult, frustrating situation (a misbehaving creature) and teaches children how love, inclusiveness, warm attention and redirection can totally transform the wayward to the wonderful. Its messaging is subtle and beautifully done. As far as its readership is concerned, The Gobbledygook and the Scribbledynoodle, couldn't be more fun for young kids. Written in rhyme and including delectable monikers that roll in the mouth like marbles (even if they are a pain to type! ), little ones will be laughing uproarously at the chaos, the naughtiness and the hand-on-mouth wording (who wouldn't laugh at 'elephant's bum'?). With a lovely balance between meaningful and funny text, this will be a winner for storytime readings, with many a cry of 'again again!'. Tom Jellett's action-packed illustrations are a joy, with plenty of texture and movement and eye-popping colour.